If you are the manager or owner of a business, ask your janitor how hard it is to maintain a clean commercial space. Your organization needs to put its best foot forward to make an impression. A messy workplace communicates even clumsier work relationships. Commercial spaces are huge and need to be cleaned every day. Just any vacuum cleaner wouldn’t hack it. You need a heavy-duty equipment that can handle the entire workload; most popularly known as a professional or commercial vacuum cleaner. Since commercial vacuum cleaners are expensive, you need to choose wisely before you invest in one. In this article, we will look at the top 5 professional vacuum cleaners you can choose from. We have picked these candidates based on their performance and value for money. For most people, getting an upright vacuum cleaner is more effective when cleaning carpeted floors. However, upright vacuums are not only to carpeted floors. Upright vacuums like Oreck commercial vacuum cleaner can be versatile. It switches automatically from cleaning hardwood floors to carpeted ones. This means no need to makes changes to its setting when the vacuum needs to adjust to the type of surface you are cleaning. The Oreck Commercial Vacuum can also be considered as one of the best upright commercial vacuum cleaners for its many features. Its Helping Hand handle makes it easy for the user to control the vacuum cleaner and even make the process simpler for those who suffer from arthritis. Aside from this, the vacuum’s on and off switch is conveniently located within the handgrip for an easy access. 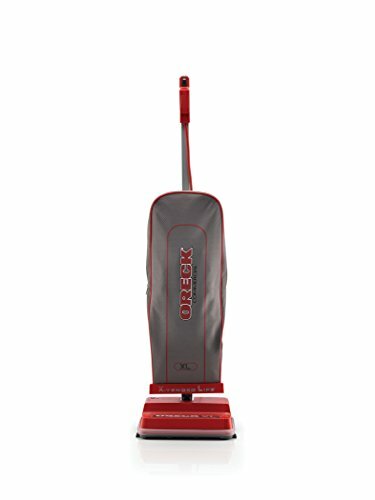 Oreck Commercial Vacuum offers a powerful and high-speed cleaning at 5000 – 6500 RPM and a high-speed roller brush. It weighs 9 pounds so it’s easy to carry and move around. It also has a 40-foot power cord which allows more cleaning range without needing to transfer it to different wall outlets. On the other hand, this vacuum cleaner’s low height will make it possible to reach under the furniture and some hard to reach areas for a more efficient cleaning. The very best industrial vacuum cleaners are known for their high air power and top of the line durability. Oreck Commercial Upright Vacuum fits the shoe perfectly. Aside from power, its direct suction capability can collect not only the dust but also large debris from both bare and carpeted floors. And with a 12-inch cleaning path, you will be able to finish the job with less effort as it covers more area at each pass. This model also features the Helping Hand and a power switch on the handgrip. It also features an automatic floor adjustment which signals the vacuum cleaner to change its cleaning modes. No need to worry about the hard to reach places as the Oreck Commercial Upright Vacuum has a low profile design which lets you reach almost anywhere. Like icing on a cake, this vacuum cleaner also features is the side brush, perfect for cleaning the corners as well as along the baseboards. It has non-marring bumpers which protect and preserve your walls, baseboards as well as furniture from a collision. 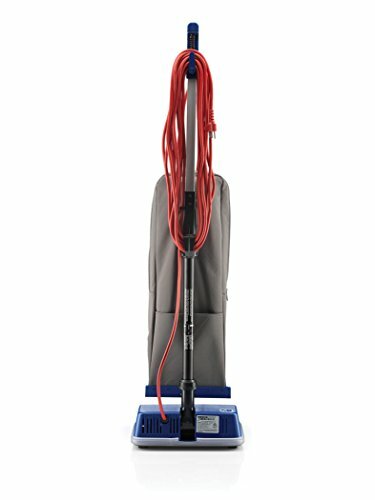 The dust capacity of the Oreck Commercial Vacuum is 11qt. It is a great advantage for cleaning commercial spaces. This vacuum cleaner can cover large areas without before it finally needs emptying. The power cord is 35 foot long. 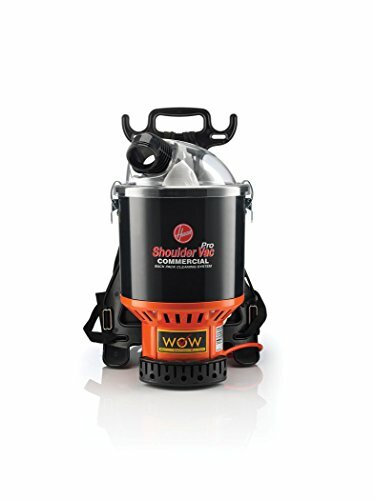 The easy to carry the style of the Hoover Commercial Shoulder Vac Pro is one of the features to love. Instead of pushing it around the area, you will be able to use it as a backpack. It weighs 9.2 pounds which is like carrying a baby on your back. This ensures that the user will not have back problems even with regular use. The Hoover Commercial Shoulder Vac Pro’s backpack design has been approved and recommended by chiropractors for comfort and minimal back pain. Since its lightweight, carrying it on your back and cleaning simultaneously shouldn’t be a problem. Because of this, it may be considered as one of the best commercial canister vacuums. Its HEPA filtration makes the product safe for those who have allergies or asthma. A competent commercial vacuum cleaner should have HEPA filters. Since many people will visit your office every day, you cannot risk them catching allergies. The clear dome lid also allows you to check on the dust status. The dust cup can hold about 6.4 quarts. This vacuum cleaner operates quietly allowing everyone to go about their business with minimum distraction. If you end up with a loud vacuum cleaner, it cannot be operated unless the place is vacant. It sports an extra long power cord measured at 48 feet. This allows you to cover 2 or more rooms without unplugging it. The Sanitaire Commercial Canister Vacuum is one of the most affordable that you can find in the market. It isn’t a heavy one either, weighing just about 10 pounds. You can also strap it to your body while cleaning. This feature will allow you to have less equipment on the floor and a better cleaning path. 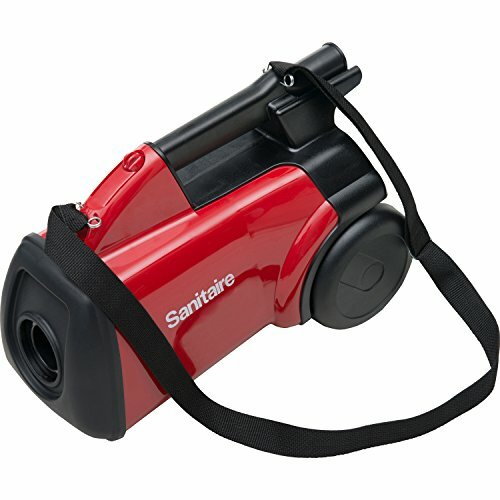 The Sanitaire Commercial Vacuum has a sealed bag system which is great for keeping the dirt and dust trapped inside. However, if you want to block out allergens, you can also get HEPA filters separately. The 7-foot hose is used to clean the floor as well as the wall and ceilings. The length is enough to collect dirt from hard to reach areas. The power cord is 20 feet long. The motor that powers it up is undoubtedly commercial grade. 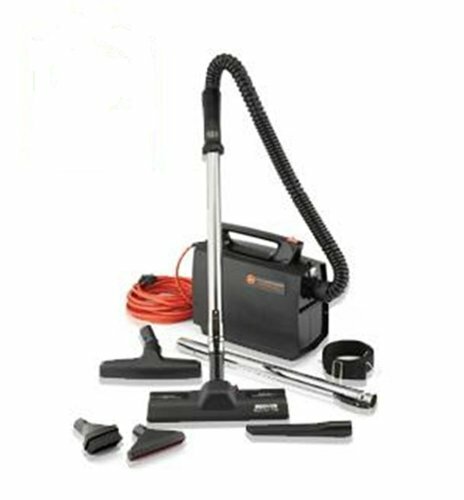 The Sanitaire Commercial Canister Vacuum comes with multiple accessories such as upholstery tool, floor tool, brush tool, crevice tool and a strap. It is designed to work best with bare floor surfaces and does not include a brush roll which is mostly used for deep cleaning carpets. Use this vacuum cleaner to collect pet hair as well especially from bare floors and upholsteries. And since this is a bagged vacuum, you do not have to clean the filters after every use. The Sanitaire Commercial Canister Vacuum comes with a 2-year warranty and offers an easy and convenient way of cleaning most commercial spaces. This portable commercial canister vacuum cleaner from Hoover is designed for superior comfort. Its compact design allows an ease of portability. It’s optional to carry the vacuum cleaner with you using the straps and have more freedom wherever you need to go. Its lightweight body, which is only 8.3 pounds, makes it easy to carry it like a backpack. There is a generous number of accessories included with the Hoover PortaPower. Stretch hose, crevice tool, wall and floor brush, furniture nozzle, rug and floor nozzle, dusting brush and two chrome wands – this Hoover has got it all! Another great feature of the Hoover PortaPower would be its blower functionality that you can use in case the need arises. This particular vacuum cleaner is made for cleaning larger rooms, as the power cord is 33.5 inches long. It will make the cleaning job more convenient and avoid unplugging the cords which are usual for vacuum cleaners with shorter power cords. With its great features, the Hoover PortaPower is also one affordable vacuum cleaner which works well for commercial use. Its strong suction will collect large debris as well as fine dust. You also get a wide cleaning path which is 12 inches for better coverage. The stretch hose on the Hoover PortaPower makes it functional for extended reach. If your office space were as large as a football field, the PortaPower would still be able to cover it with the smart operation. The Hoover PortaPower only comes in black and has a 1-year warranty. 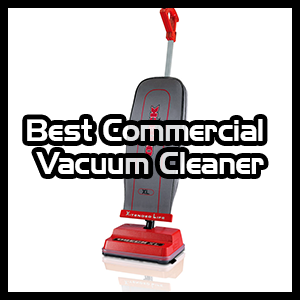 It makes a superb commercial vacuum and should be considered especially if you are a bit tight on the budget. Just so you know – there are many different kinds of vacuum cleaners you can choose from! They can be classified based on their structure, inner mechanism, and functions. You have your uprights, canisters, handhelds and so on. We will overview the most popular ones in this segment. This type is named after the rigid standing position it takes while vacuuming. These are the powerful ones with little scope for maneuverability. Upright vacuum cleaners have a main body that contains the canisters or bags, the motors and the filters. Accompanying the main body, there is a cleaner head on one end and a power cord on the other. Upright vacuum cleaners are not fixed on a permanent position either. Thanks to the power cords and steering wheels, they can be dragged along as your cleaning crew moves from one cleaning are to another. This is as simple as it sounds. You can lift and carry the entire compact body of a handheld with your hands. Handheld vacuum cleaners are made small for ultimate convenience. These aren’t as powerful as uprights since they are designed for a different purpose. If you need upholsteries, walls, curtains, stairs or even ceilings cleaned, this is your go-to vac. The canisters come without extra baggage to worry about. You just drag along a light round or cylinder shaped container that holds the dirtbag and the motor. There is a cleaning head attached to it with a wand and an extension hose. Canister vacuum cleaners mark the fine line between uprights and handhelds. They cannot house powerful motors like an upright. They are not completely maneuverable like a handheld either. If you are looking for a relatively cheaper model for average cleaning sessions, get a canister. Backpack vacuum cleaners are for your cleaning crew to wear on their backs. These are lightweight and designed for back support. Walking around with these strapped on your back does not weigh you down. You can move naturally. Moreover, these leave your hands freed up for facilitating the cleaning session as you like. Wet & dry vacuum cleaners are the jack of all trades. They pick up all kinds of dirt, no matter dry or wet. From debris, dust and hair to liquid wastage, there is nothing it can’t handle. If you wet the floors and vacuum them, the outcome will be as good as mopping. Wet and dry vacuum cleaners are a must-have equipment for commercial spaces that collect many different sorts of dirt. If adequate manual labor is not available, consider getting one of these. Wet/Dry vacuum cleaners are exemplary for garages, workshops and construction sites. These vacuum cleaners feature wide cleaning paths that cover large portions of your floor at every pass. Wide area vacuum cleaners also come with EXTRA long power cords. Sure, they can be expensive. But wide area vacuum cleaners are perfect for cleaning auditoriums and large halls. Do you really know how to tell a great vacuum cleaner from an unimpressive one? Don’t let those sales speeches fool you. We’ll drop some knowledge. Here are a few major things you should look for in a professional grade vacuum cleaner. Scenario #1. You have just purchased a vacuum cleaner with strong air power. It’s designed to dig through thick carpets. But hardwood floors are dominant in your commercial space. What happens then? If you proceed to vacuum, your precious hardwood floors will get scratched. And you would have wasted money on something you didn’t even need. It is crucial to get a vacuum cleaner that is compatible with the dominant floor type of your commercial space. The filtration of your vacuum cleaner tells you how capable it is for capturing dirt. HEPA filters are, hands down, the best filtration a vacuum cleaner can have in 2019. They not only capture the tiniest dirt particles but also remove allergens. If HEPA filtered vacuum cleaners are a bit out of your budget, go for the sealed system ones. Commercial vacuum cleaners are expensive purchases and their burdens are heavy. You want one that will last a long time despite daily use. Before buying a vacuum cleaner, check out the list of accessories they come with. Usually, a vacuum cleaner comes with a full kit with different accessories for different cleaning jobs. If a vacuum cleaner features a motorized pet tool and pets are not allowed in your office, do you really need that? Choose a vacuum cleaner with the right attachments for your commercial space. All professional grade vacuum cleaners described above have their own sets of features. Which one has the potential to provide the most value to you, depends on what you are looking for. The journey to finding your perfect commercial vacuum cleaner starts from knowing the ins and outs of your office space. Decide on a range of budget as well to narrow your options down. Weigh the pros and cons or just take the plunge – we’re here to help! Leave your questions in the comments section. We’ll get back to you! Our dog training facility has just installed a rubber floor in the training room. We need a vacuum to pick up sandy dirt (desert location) and dog hair. We also need a wide path vacuum because it is an open area of 3000 square feet. Do you have any suggestions? Thank you. Any wet or dry commercial vacuum cleaner with pet hair specialty will do great here in your mentioned context. These vacuum cleaners have wide comparatively wide cleaning path. Your desired vacuum cleaner should have dedicated carpet settings, it will ensure increased suction power thus yours is a rubberized surface. Moreover, your desired vacuum cleaner must have hard bristled brush in the floor nozzle to create proper agitation while picking up the dirt from the sticky rubber floor. You can find several choices that will meet your expectation.